Do you know a young person that wants to get into bicycle touring, but needs some financial help? 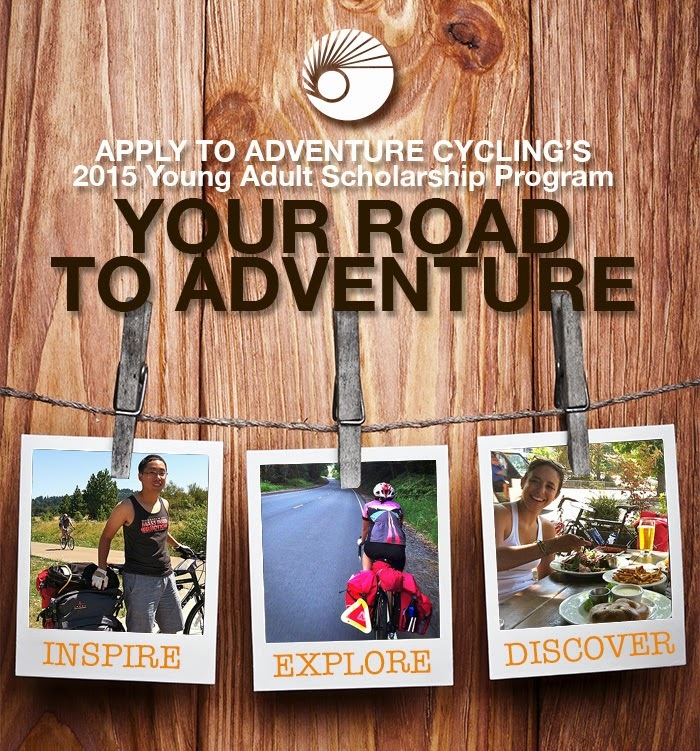 The Adventure Cycling Young Adult Bike Travel Scholarship program was developed in 2014 at the request of Adventure Cycling Association members as a way to sponsor young people on tour and share the experience of bike travel. The goal of the scholarship is to provide young adults, ages 18-25, with access to bicycle travel through participation in one of the ACA's Educational Courses. 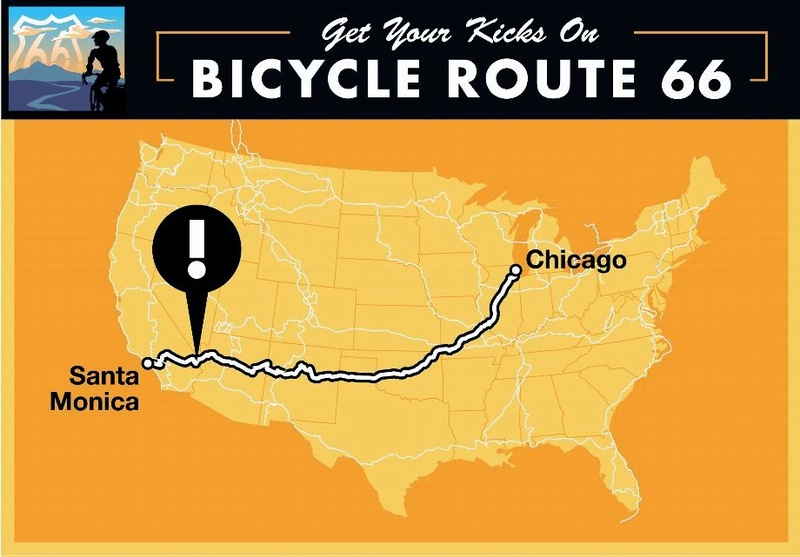 Upon completion of the course, scholarship recipients will perform outreach activities for their communities and peers to promote the activity of bicycle touring. 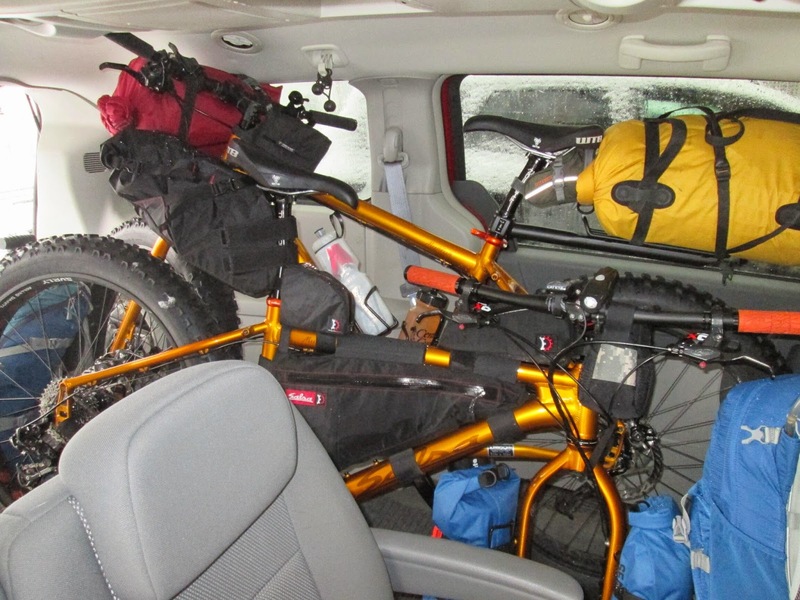 For the 2015 program, Adventure Cycling Association is seeking candidates who will choose to participate in either the Leadership Training Course (LTR) or Introduction to Road Touring (IRT). Each scholarship covers transportation to attend one of the courses, the cost of the course (which includes meals and accommodations), as well as a new touring bicycle equipped with bike travel gear, such as panniers. Eligible candidates will be ages 18-25 and have an interest in bicycle travel and touring. Learn more about the 2015 Educational Course options. Read about last year's winners, Alice Viana and John Nguyen. The Adventure Cycling Association's mission is to inspire and empower people to travel by bicycle. Established in 1973 as Bikecentennial, they are the premier bicycle-travel organization in North America with more than 35 years of experience and 47,000 members. Included in the 42,180-mile Adventure Cycling Route Network is the Underground Railroad Bicycle Route, which passes by the Century Cycles stores in Medina and Peninsula, and the Northern Tier Route, which passes by the Century Cycles store in Rocky River. Century Cycles is a Member Bicycle Shop of the Adventure Cycling Association. The annual North American Handmade Bicycle Show comes to Lousville, Kentucky on March 6 through 8, 2015. The last time the NAHBS came close to NE Ohio was back in 2009 in Indianapolis. If you enjoy getting an up-close and personal look at beautiful hand-made bicycles (like the one from Groovy CycleWorks of Wooster, Ohio pictured above), then get yourself down to Kentucky in March! Click here to read read the article on NPR's web site. 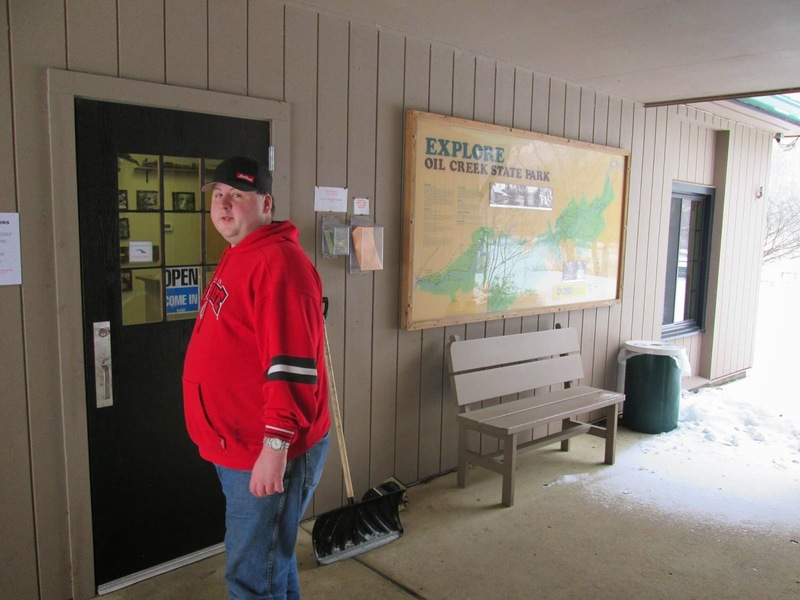 Chris got the bright idea to drive out to Oil Creek State Park, near Oil City, Pennsylvania. 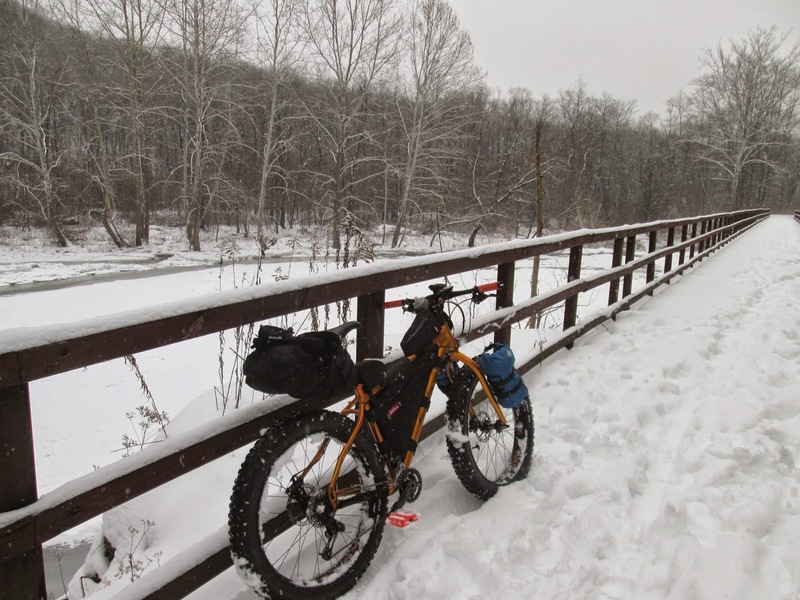 The park has a bike path that runs along the creek, which we could ride on fat bikes until we got to a hiking trail that leads to the top of the ridge overlooking the creek. 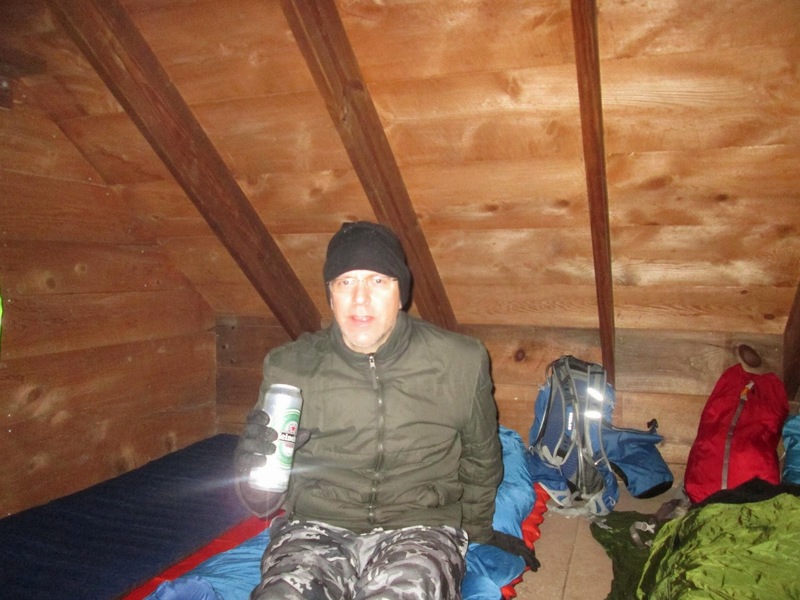 Up the ridge is a set of lean-to shelters for overnight camping. Then, we'd ride back to the car the next morning. 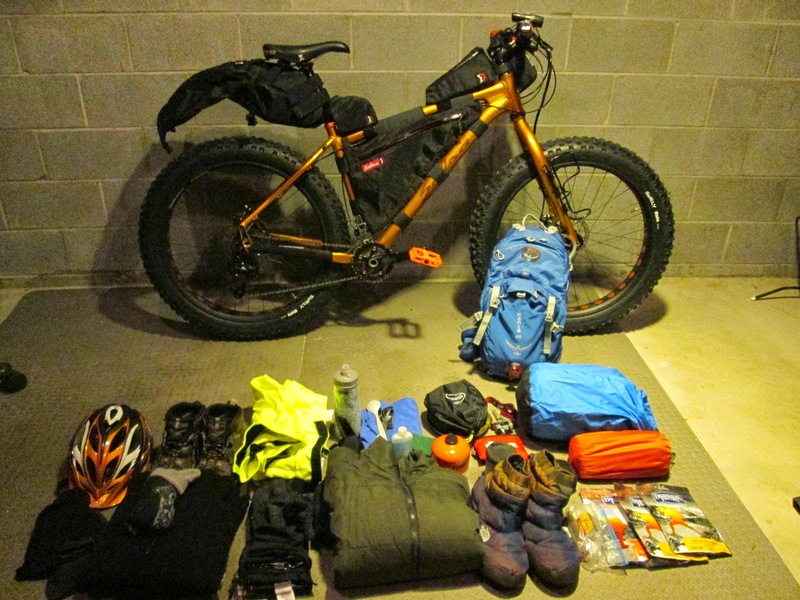 So what does one pack for a bike-camping trip in the winter time? 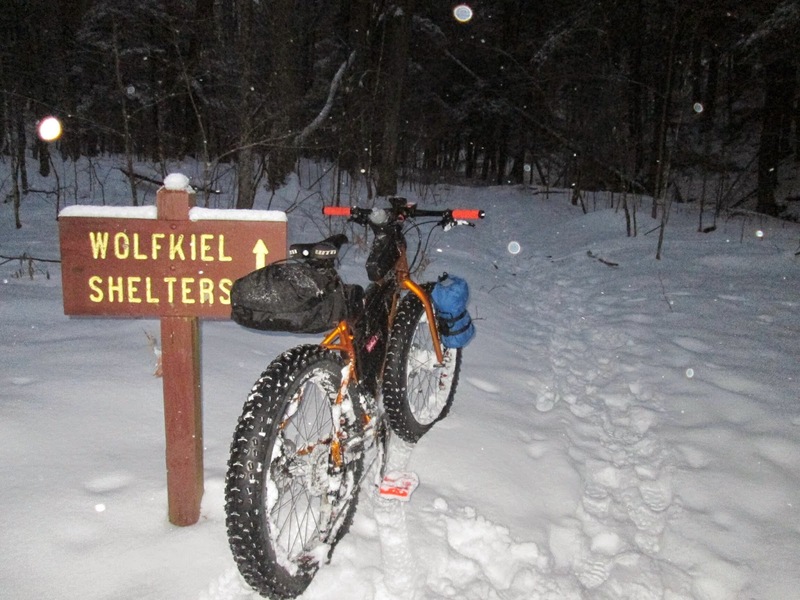 It's pretty much the same as bike-camping any other time, except you take some warmer clothes. We could save a little packing space by not taking tents, since we'd be sleeping in a shelter. So, armed with two days off, I (Kevin) met Chris and our friend Brent in Peninsula on Wednesday morning. 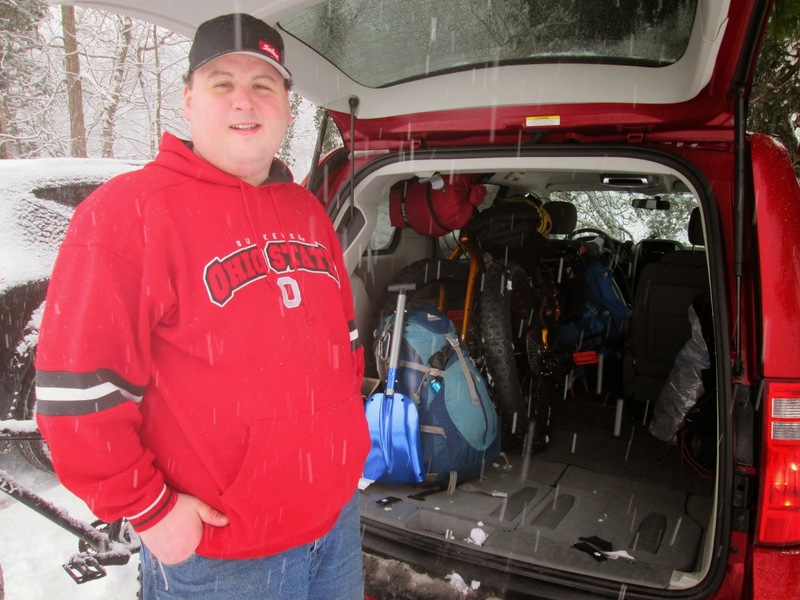 We packed up Chris's mom's family comfort cruiser van and headed out a little after 10:00am. 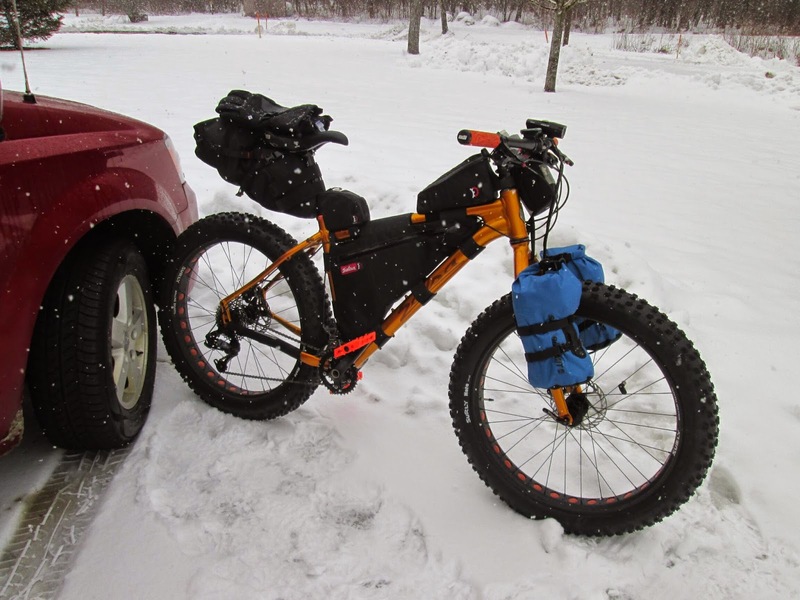 The weather proved appropriate for our winter bike-camping endeavor, and the Ohio turnpike traffic was treacherous. We made a lunch pit stop at a Promised Land outside Youngstown. We continued across state lines, and arrived at Oil Creek State park without incident. We stopped in the park office to make sure our shelter reservation was in order, let them know we'd be leaving the van at the office overnight, and say Hi to the local rangers. They said, "So you're going to hike to the Wolfkiel shelters?" We said, "No, we're going to bike." "You're going to WHAT?" 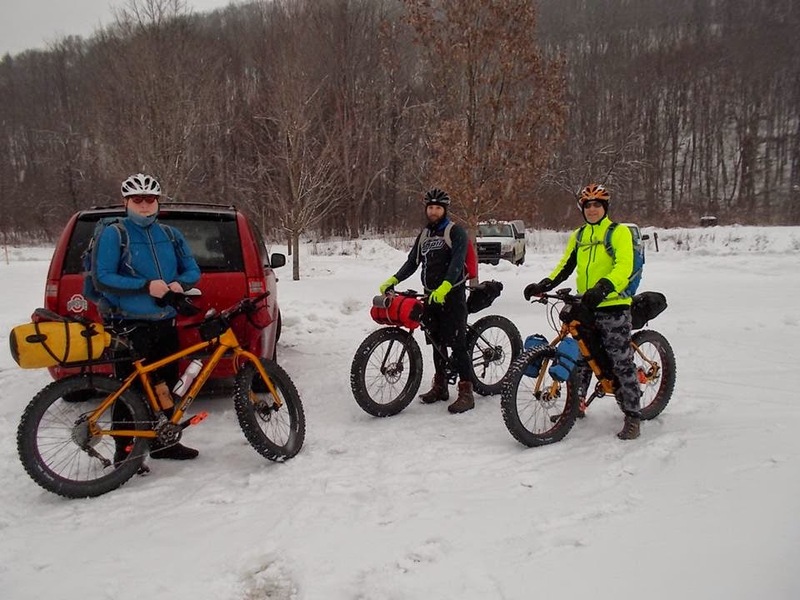 Once we explained the fat bike concept to them, they told us that last weekend, there was a big fat bike race in the area, which drew a lot of attention from around the state. 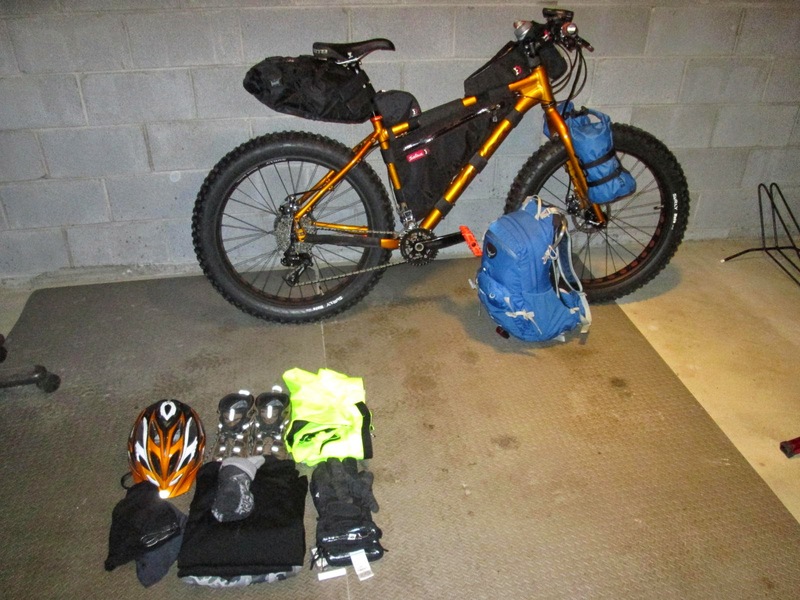 We made our final gear preparations and got ready to hit the trail. Brent rode his brand new Surly Ice Cream Truck. We finally headed out around 1:30pm. There was a short stretch (about 1/2 mile) of road before the bike trail began. 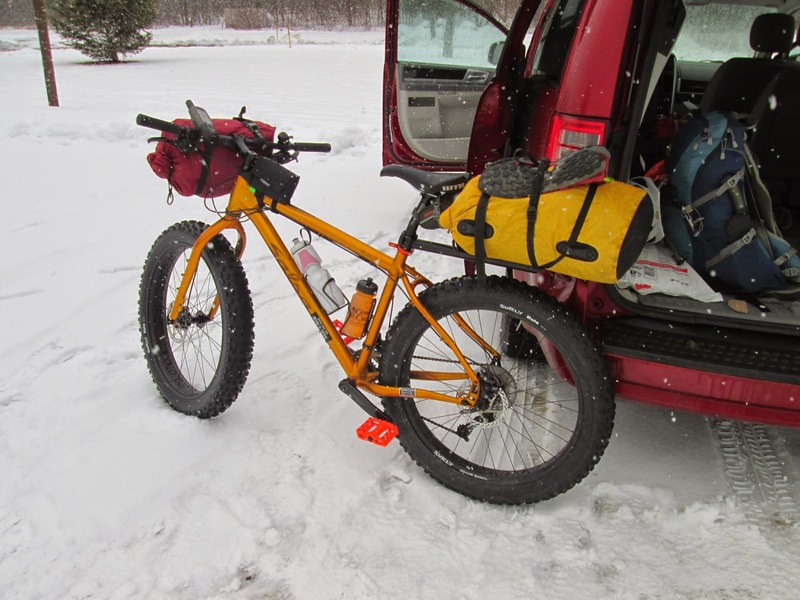 The road had a layer of fresh slushy snow on it--short order for our fat bike tires to handle. 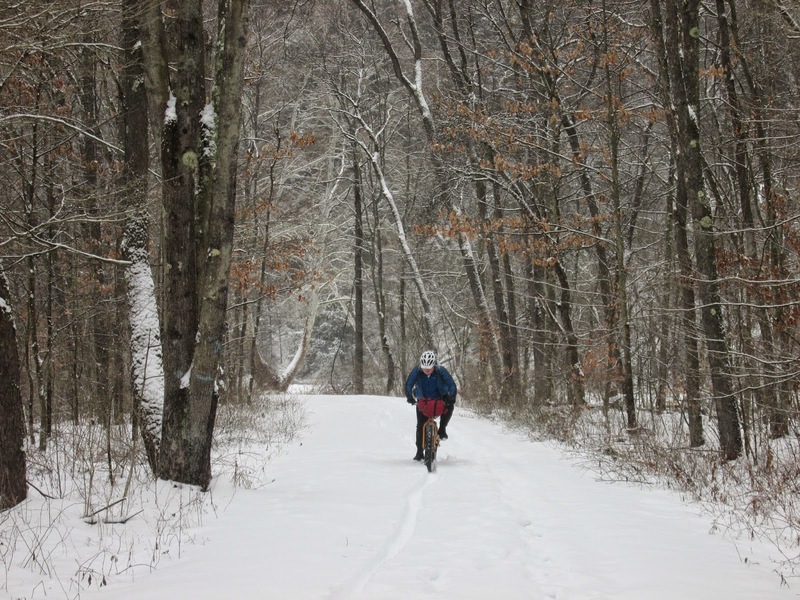 Once we got to the bike trail, we found it to be covered in at least six inches of fresh snow. There were some recent hiking tracks, but it looked like they had been covered over by a day or two's worth of new snow, so we were pretty much breaking fresh trail with our bikes. 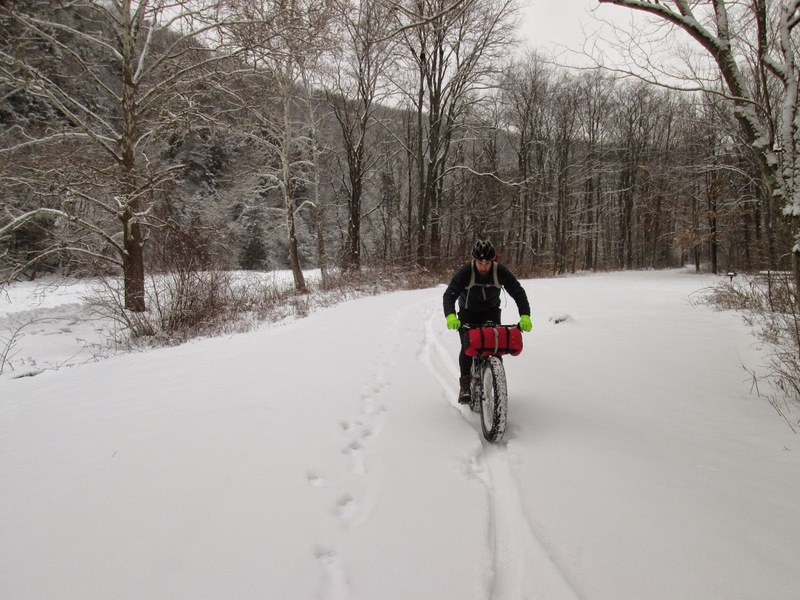 Even with the fat snow bike tires, this proved rather difficult, and it was slow going. The scenery around the state park along the Oil Creek provided a welcome distraction, though. 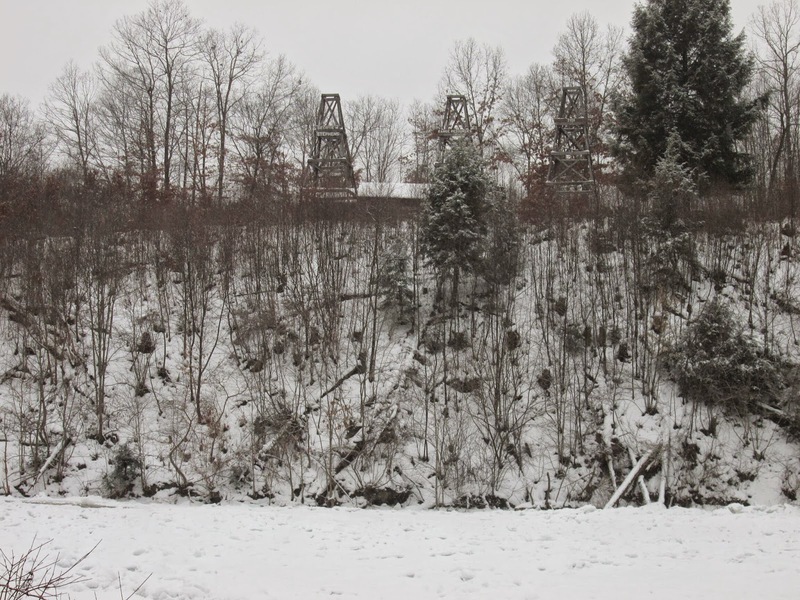 The Oil City area is the site of the first discovery of oil in the US, and much of the historical exhibits focus on the old original oil derricks and related items. 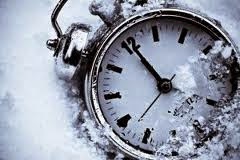 We continued to trudge along through the wet, sticky snow. Brent and I took turns every quarter-mile or so, with one of us leading the way, while the other followed along in the tire track. Chris lagged a bit behind. 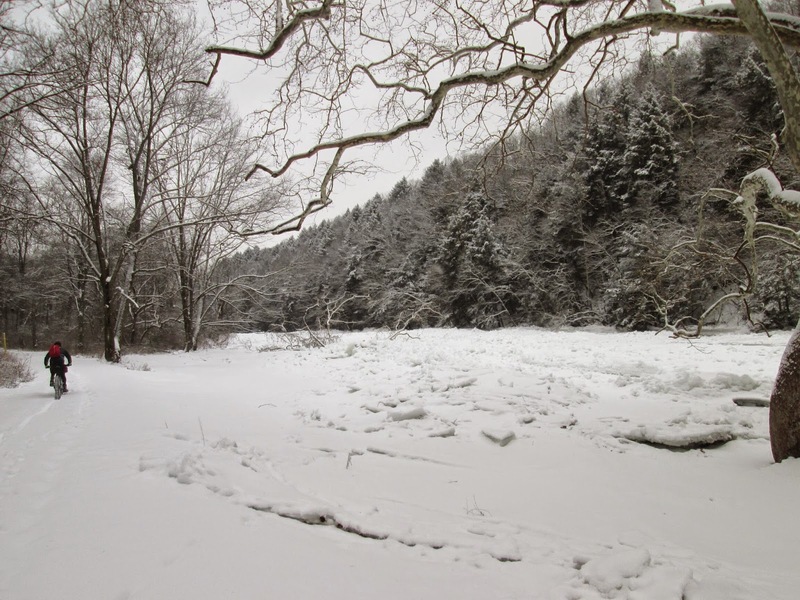 At not quite 2 miles along, we crossed a bridge over Oil Creek, with its surface almost completely frozen over. A bit further out, we came to the first of two warming huts along the trail. At the 3-mile mark, we came to the second warming hut. 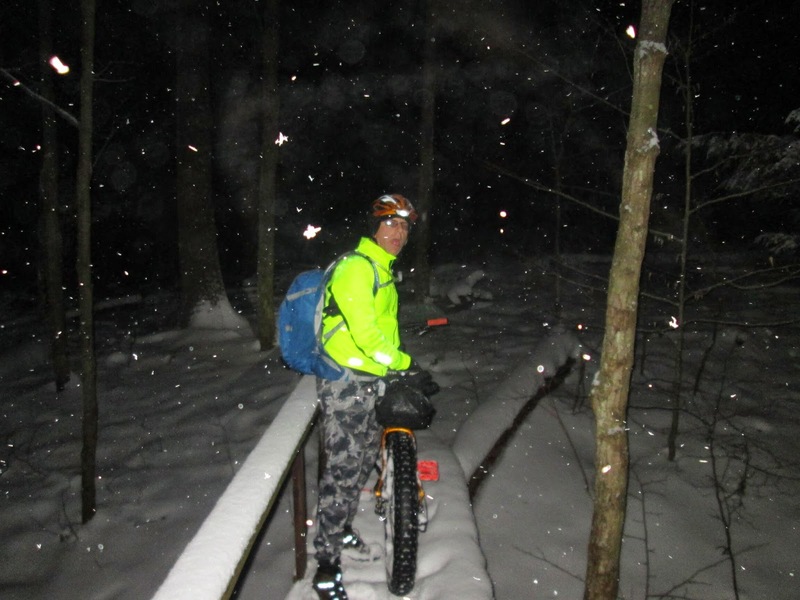 The temperatures were in about the mid-20's range, perfect snow-biking conditions, and as we pedaled along, we actually got pretty warm. 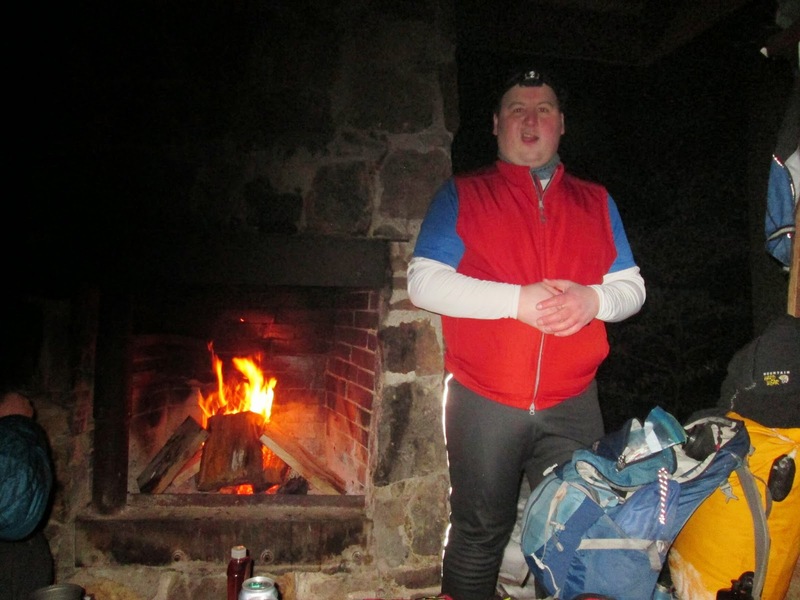 I took off my outer ski gloves and opened up my jacket to ventilate as we waited a while for Chris to catch up again. 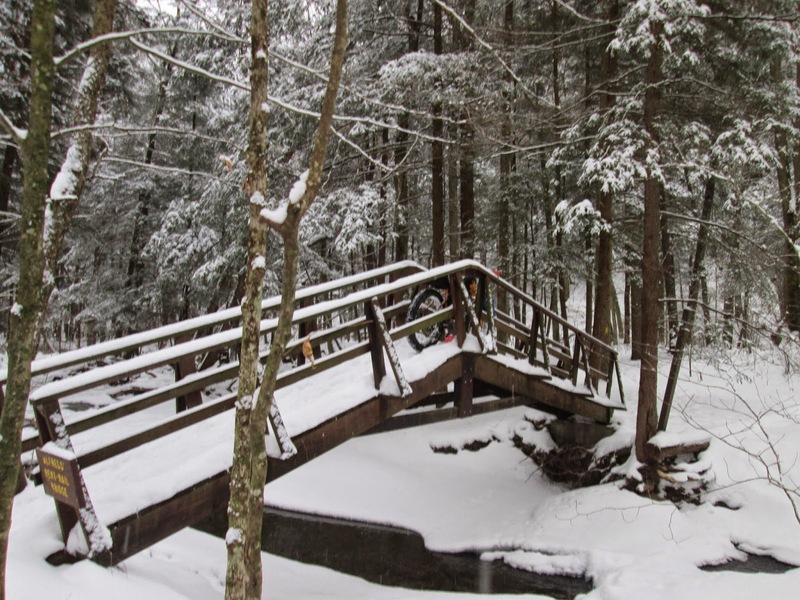 Between the 3rd and 4th miles, there were some hiker tracks that were a little fresher, still covered with snow, but they made the trail a little more packed down and easier to navigate. Brent and I still took our turns. The 5th mile was the worst of all, with the deepest un-tracked snow we came across all day. 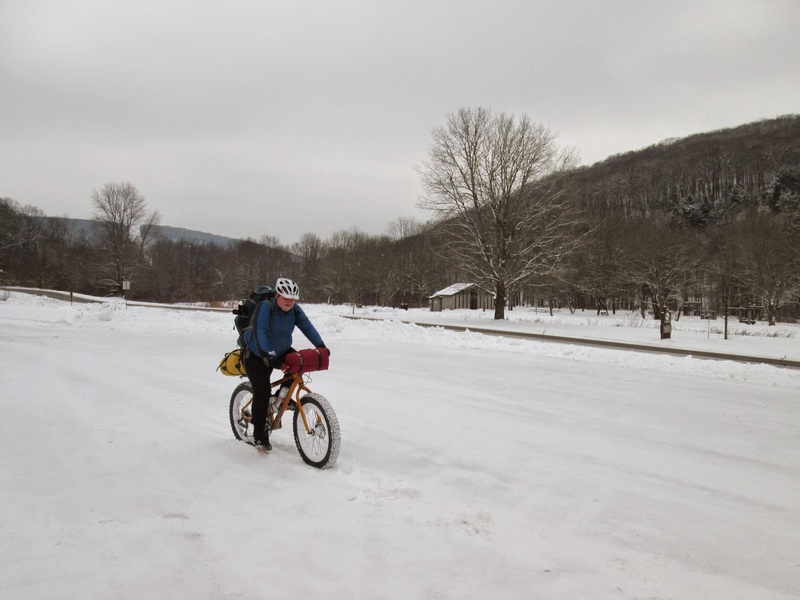 A consistent problem was the snow packing up on our pedals, making it hard for our boots to grip to control the bikes. Finally, just before dark, we arrived at the trailhead leading up to the shelters. For the first part of this trail, the snow wasn't too deep, was somewhat packed, and very bike-able. 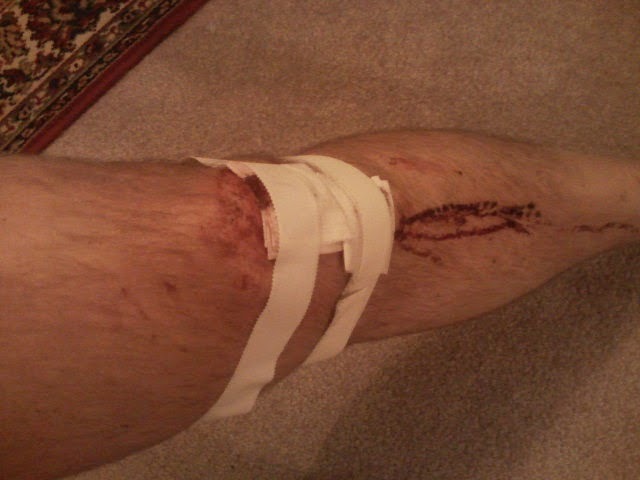 It wasn't long, however, before it turned steeply uphill. It would have been quite a challenge just walking up this trail in the snow, even not considering pushing 60 pounds of bike and gear. When we finally made it to the shelter, before we let ourselves get too comfortable, Brent got busy starting the fire, while I robbed all of the neighboring shelters of their stock of firewood. About 15 minutes later, Chris arrived, and we unpacked our gear and got busy making our dinners. The shelter gave of plenty of room to sleep three-across with plenty of elbow room; it could sleep 4 or 5 who are willing to get cozy pretty easily, and at 15 bucks a night, it's a bargain accommodation. We enjoyed our dinners, then sat and did the usual campfire shooting-the-breeze before we settled into our sleeping bags. The temperatures stayed about the same, and it wasn't too windy, so despite the open side of the shelter, the fire kept us pretty comfortable. I didn't sleep so well most of the night, though, possibly from all the caffeine I drank at lunch, or maybe due to dehydration, or maybe a little of both. I took more than my fair share of turns adding wood to keep the campfire going. At one point, I think I spent about an hour just sitting up and staring at the fire, one of the simple pleasures of camping. Not long before sunrise, I think I got about an hour of good sleep, then around 8:00am, all three of us woke up, with the fire nearly out, and all three of us freezing. Chris made short work of getting the fire going again, so we were comfortable preparing our breakfasts and coffee and re-packing our gear. I ate my Dark Chocolate Cheesecake dessert for breakfast, and decided to save my Egg-n-Baco Omelette for a future trip. We headed out around 9:40am. The downhill trail off the ridge made it a much easier trip compared to the uphill slog the night before. My mountain biking skills came in handy, although I did have to dab a foot here and there, and walk over a small rocky stream crossing. 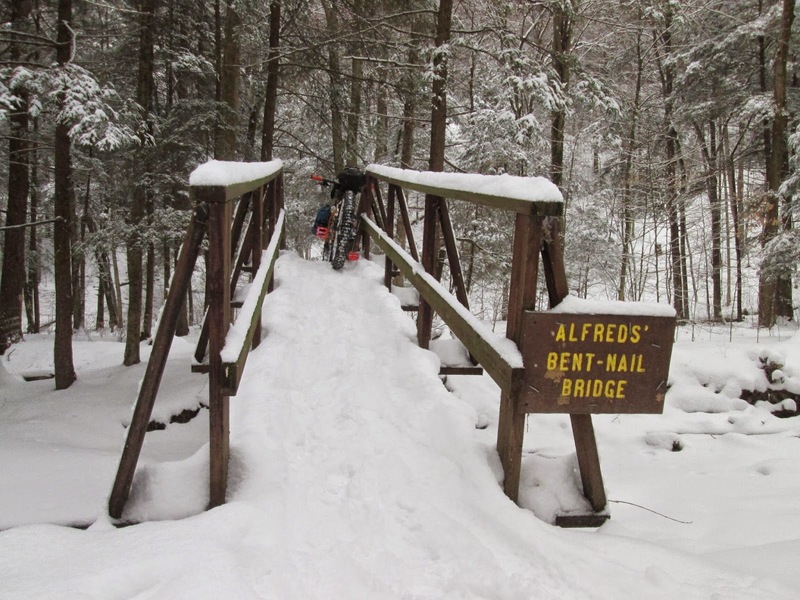 Back on the flat section, there's a bridge that would only be ride-able for the most expert snow biker. Still, what was a 30-minute hike uphill the previous night was a 10-minute downhill ride. Brent and I waited at the bike path for another 10 minutes until Chris caught up. We made sure we had his car keys before heading back for the 5-mile ride on the bike path back to the park office. Despite more fresh snow overnight, out tire tracks from the day before were still visible and packed, so that made the trip back a little easier. Still, steering along an existing tire track is much harder than it sounds, and takes all of your concentration, making it tough to enjoy the scenery around us. 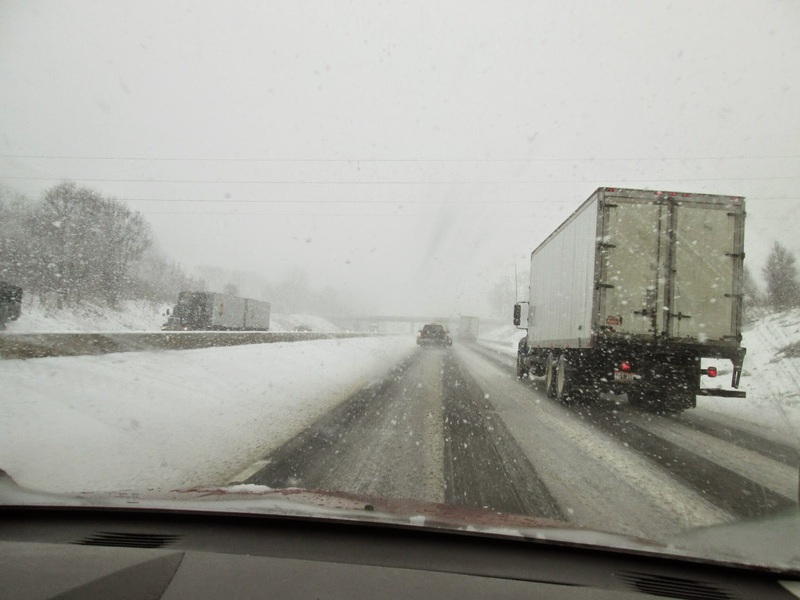 Occasionally, we'd still lose control and have to stop, dismount, knock the snow off our pedals, and get going again every quarter-mile or half-mile. Partway back, we passed a group of three hunters (and their two dogs). We were minor celebrities already, because they said they had seen our picture on the park's Facebook page the day before! Brent and I made it back to the van about 90 minutes after we left the shelter. We changed into dry clothes, and waited in the warm running van for Chris to arrive a while later. 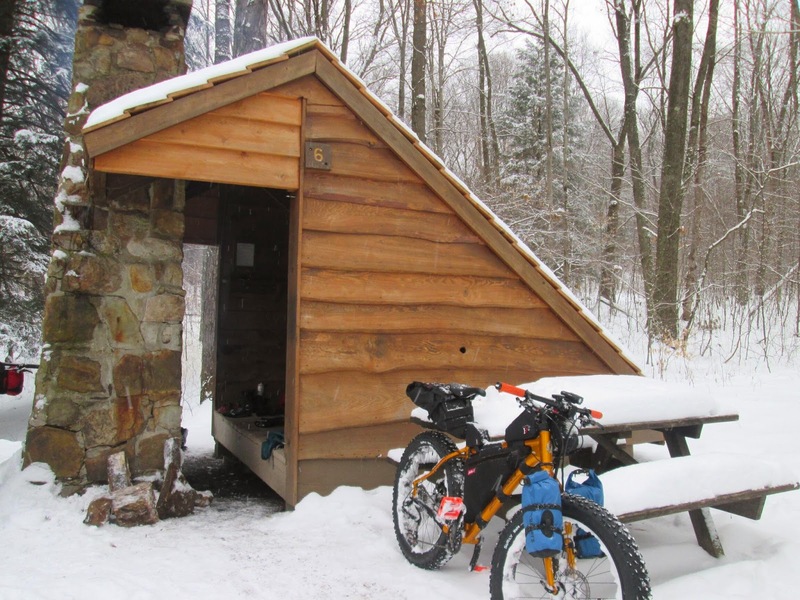 Another bike-camping overnight trip in the books, our first on snow bikes, with tales of adventure to tell! 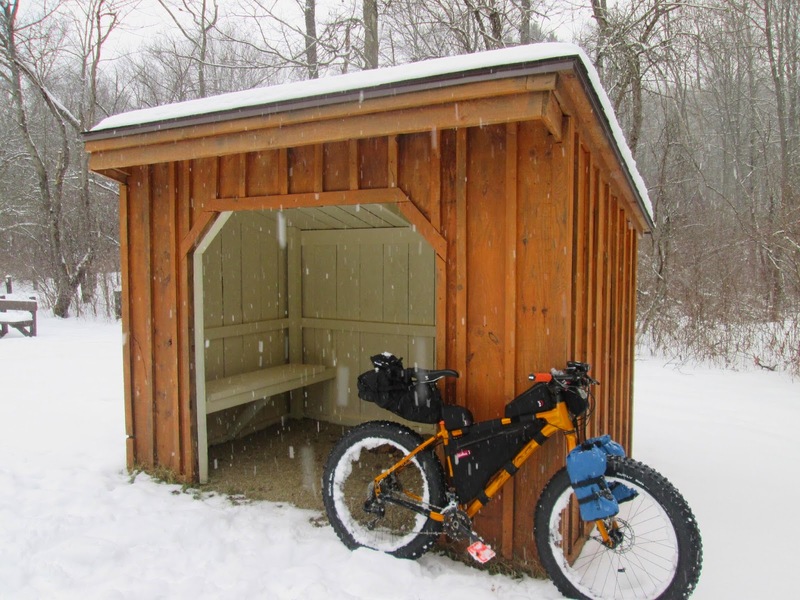 If you're thinking about a bike touring overnight trip, whether it's a one-night S24O or a months-long cross-country trek, come to Century Cycles for your gear and expert advice! 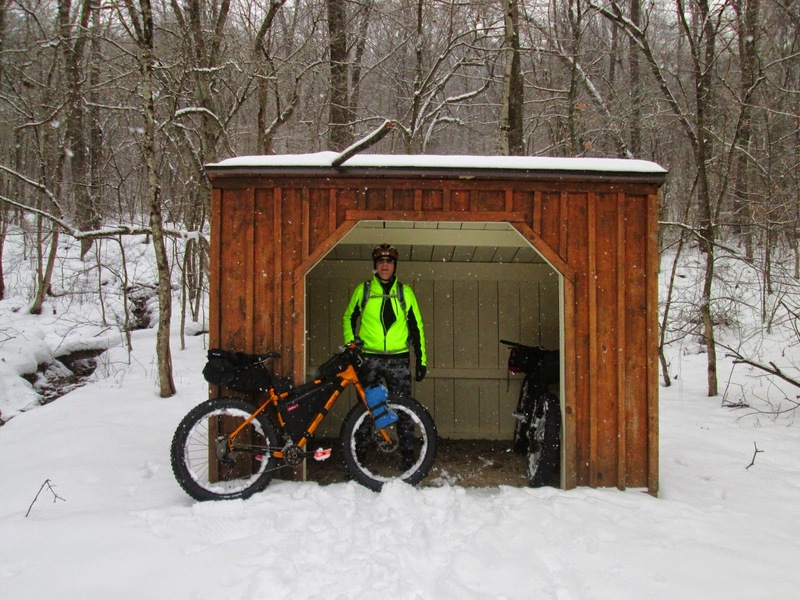 And, come to our FREE Bike Touring Class on Saturday, February 7, 2015 at 1:30pm in our Peninsula and Rocky River stores, part of our School Of Bike series! Last summer, in the middle of a beautiful blue-sky day, Doug at the Century Cycles store in Peninsula happened to notice the Google Street View car heading through on State Route 303. He and Ingrid gave a friendly wave as it passed by the store. Lo and behold, they recently turned up on the Google site! The captured image is above; you can check out the online version of Google Maps here. 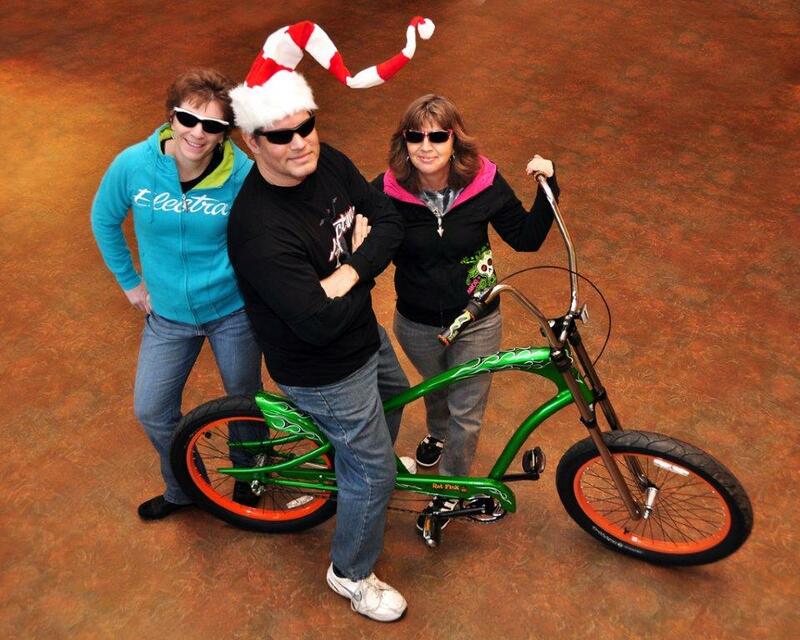 Here at Century Cycles, we've lived our motto of "Define your life. Ride a bike." and know the power of bicycles to change lives. Giant Bicycles, with their "My Ride Life" initiative, is collecting stories from riders like you of how cycling has saved and transformed their lives. Their latest video story (above) tells about how James Mitchell of Decatur, Illinois lost over 100 pounds in less than a year after purchasing his first Giant bicycle. You can submit your own cycling story by going to the Giant Bicycles USA Facebook page and click on the My Ride Life tab. So, you've taken the leap and purchased your first snow bike. Maintaining the correct air pressure is critical to maximizing performance and pleasure on any bike ride. 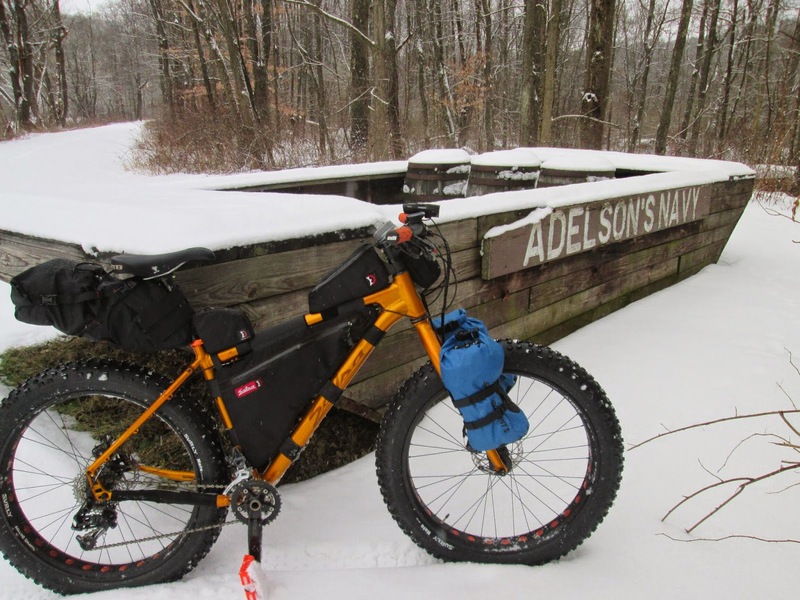 With the low pressures of fat bike tires, even a half-pound can make all the difference. But look at the built-in gauge on your floor pump--it barely registers anything less than 20psi! 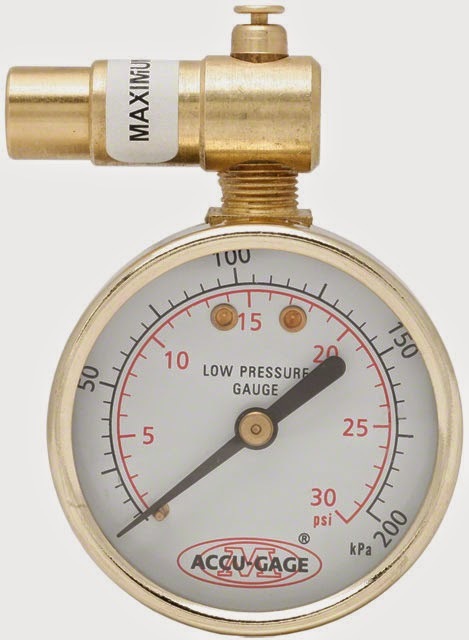 The solution is this handy Meiser 30psi Presta-Valve Dial Gauge with Pressure Relief. Low range for dialing in fat bike pressures on varied terrain. Helps to fine tune tire pressure for the ultimate in performance. Compact design fits easily into handlebar or seat packs. In stock now at Century Cycles! What pressure should you have in your snow bike tires? If you're riding on pavement, pump them up near the max around 15-18psi. 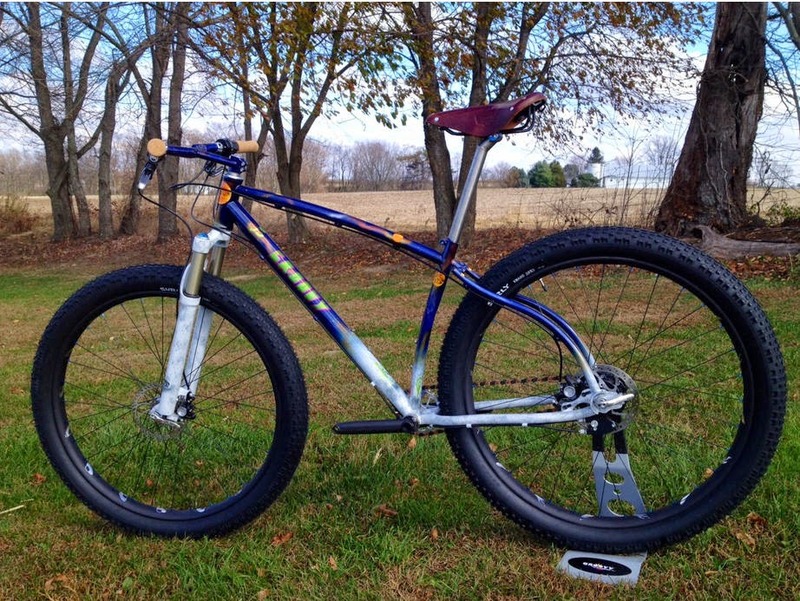 For mountain biking on dirt, about 8psi is a common sweet spot. For packed snow, go with 7psi. For fresh deep snow, you can go as low as 5-6psi for the best floatation and traction. 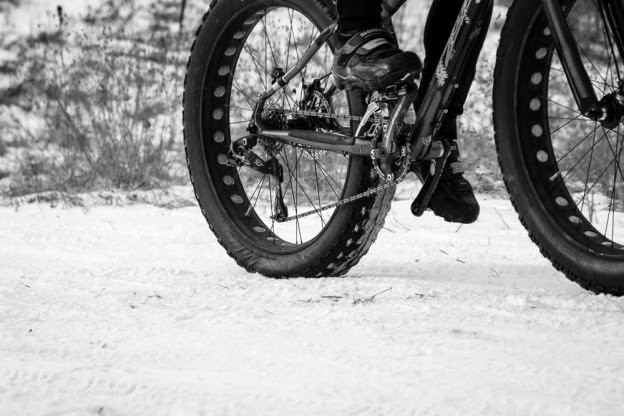 Rider weight and varying snow or dirt conditions will require some adjustments to the above pressures. If you're less than 140 pounds, you can drop a pound or so in your tire pressure. If you're over 200 pounds, add a pound or so to your tire pressures. In the end, your experimentation and experience in different conditions will be best in finding what works best for you. 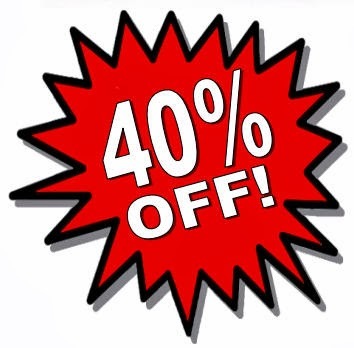 Hot Deals for Cold Days #5 brings you 40% OFF essential cycling accessories for both men and women! 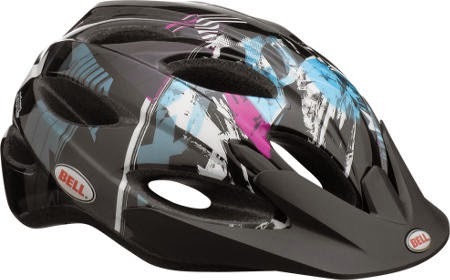 Brought to you by Giant Bicycles and Liv Cycling, the women's-specific division of Giant! 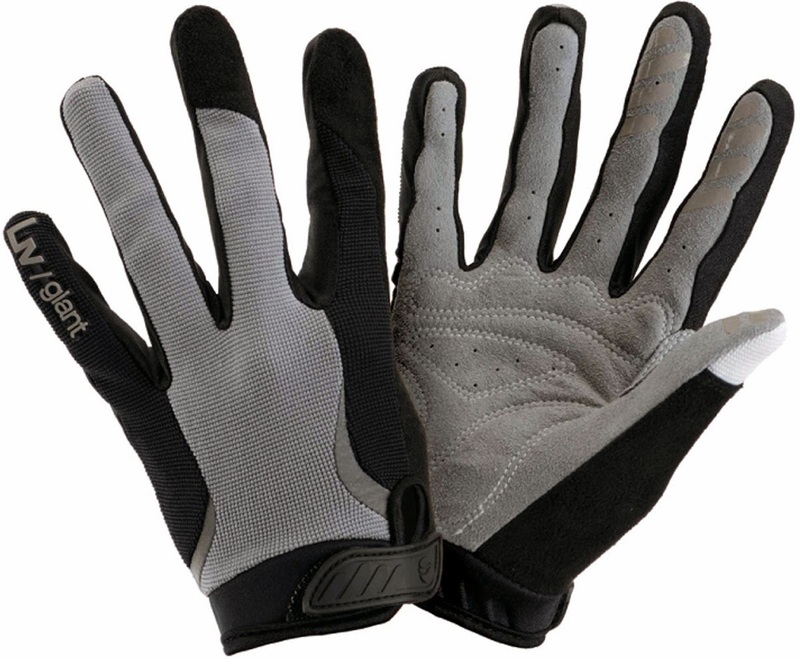 Full-finger cycling gloves are traditionally used by mountain bikers for protection from weeds, thorns, and the inevitable spills in the dirt. Whether you're in the woods, or on the road or bike path, they're also great to keep chilly fingers at bay during spring and fall rides. 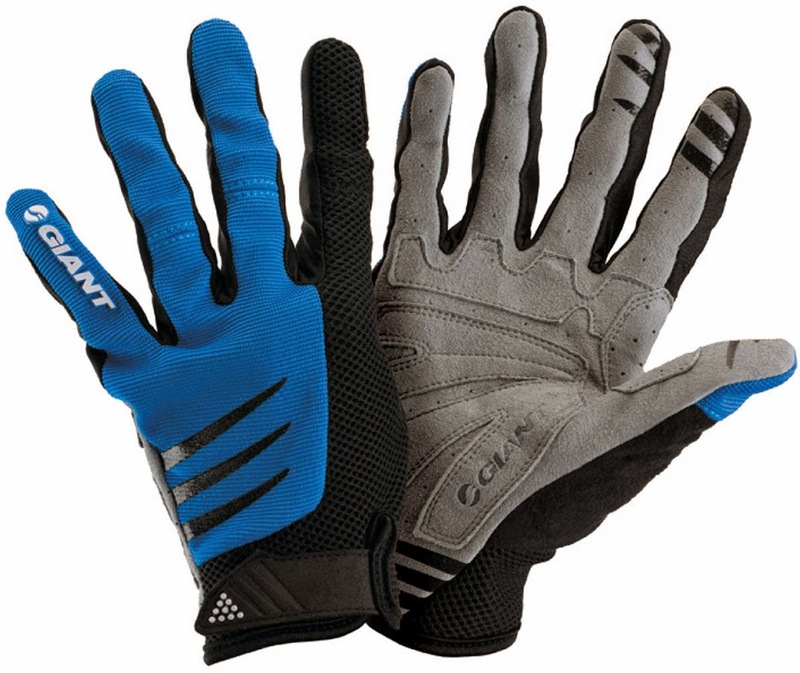 The Giant Trail Full-Finger Gloves have a double-layer of vented Clarino leather in high-wear areas and light padding, airy 4-way stretch mesh construction, gusseted fingers, and Flex panels to make them breathable, light and completely non-restrictive. Silicone details on the palms help you keep your grip. $20.99 (regularly $34.99) in Blue as shown with Men's/Unisex sizes MD, LG, XL, and XXL. The Liv Velocity Full-Finger Gloves are made of a 4-way-stretch fabric for a great fit, boast soft Clarino palms for protection and comfort, and feature breathable mesh backs. The fingers are contoured for a non-restrictive flex. 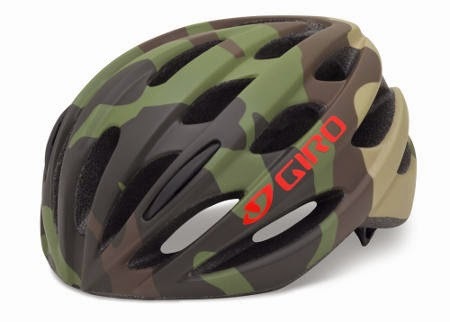 You'll love the Velcro closures, microfiber face-wipers, and silicone appliqués for all-weather grip. $14.99 (regularly $24.99) in Black as shown with Women's sizes SM, MD, and LG. Arm warmers provide shoulder-season versatility. Put on a short-sleeve jersey with arms warmers for long-sleeve warmth. When the day (or your riding effort) heats up, peel off the arm warmers, roll them up, and they stow easily in your jersey pocket. 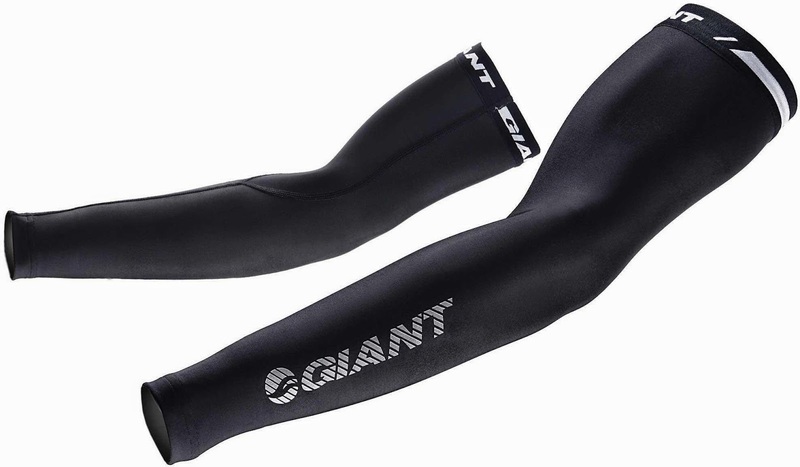 Giant 3D Arm Warmers are made from light spandex fleece for superb warmth and comfort. 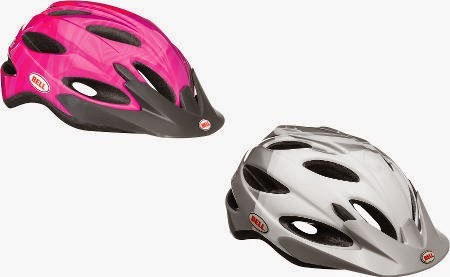 The elastic grippers keep them in place and reflective accents add to your visibility in low light. $17.99 (regularly $29.99) in Men's/Unisex sizes MD, LG, XL, and XXL. 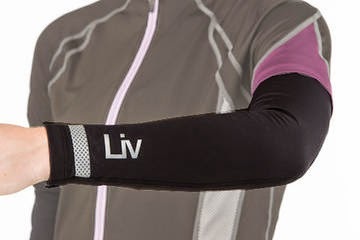 Liv Arm Warmers have warm and soft brushed fabric that transfers moisture, breathes easily, and dries quickly. And, they have reflective details at the wrist for visibility. $17.99 (regularly $29.99) in Women's sizes SM, MD, and LG. This Hot Deal is good only January 15 - 28, 2015 while supplies last on in-stock merchandise only. In-store purchase only; no online or phone orders accepted. No coupon necessary. 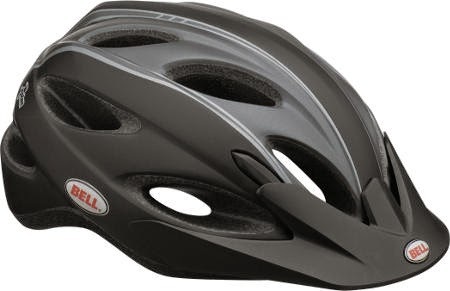 Attention cycling enthusiasts! Want to live your passion and work with our fun crew? We have an immediate opening at the Century Cycles store in Medina for a Sales Associate. We offer competitive wages and benefits for our industry. Prior bike shop and retail experience is preferred. You must be friendly, outgoing, and a quick learner. Computer skills are also a plus!